Gooey cheese all wrapped up in grilled bread and crispy bacon. These Crispy Bacon Grilled Cheese Roll Ups are seriously heavenly! Place one slice of cheese (or 2-3 tablespoons grated cheddar). Roll up bread & cheese. Wrap one slice of bacon around each roll securing with a toothpick. Place in a pan over medium-low heat. Add a small spoonful of butter & using tongs, rub the rolls in the butter ensuring the bread edges are covered. Continue adding bits of butter and turning with tongs until all sides are browned and cheese is melted. 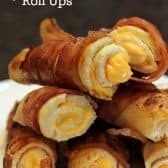 You can use cheese slices or real cheddar cheese in these roll ups with delicious results!